One of my simple guilty pleasures that I indulge in on every trip to the DC metro area: A “Half Smoke” hot dog , with mustard and “cooked onion” sauce. Many of you that aren’t from broader Washington, DC metropolitan area are probably asking, “what the heck is a half-smoke?” Like many areas (Chicago and Rochester being particularly good examples), Washington, DC has it’s own particular variant of the hot dog, the half-smoke. A half-smoke is a close cousin to the hot dog, but is a slightly larger and spicier sausage, with a level of seasoning halfway between a typical smoked sausage and a hot dog, hence the name. Interestingly, however, the sausage itself isn’t smoked (halfway or otherwise). Despite the odd name, the half-smoke is one of the things I like about the DC area, and it’s obvious I’m not alone. 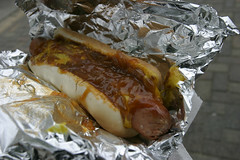 Half-smokes are pretty much ubiquitous around the DC area, with virtually every hot dog cart having them (along with the nearly obligatory “cooked onion” sauce, although chili makes a fine topping as well). Indeed, I usually never need to stray far from a Metro stop (Ballston, in this case) to score a half-smoke with mustard and cooked onions. I always like this combination; the meat is slightly more coarse than a hot dog, the spicing of the dog works well with the slightly spicy onion sauce, and the the mustard gives it a good tang. Most any time we end up traveling with my brother Dan and his wife Sophie, we usually try to go out for at least one fancy dinner and live it up a bit. When we were in Belgium, we figured this would be a good opportunity to check out Belga Queen, one of the trendy Brussels restaurants that has been a hot spot for several years. Located just down the street from the Royal Theater, Belga Queen is fashioned out of an early 1900s bank, back in the era when banks were pretty much expected to have elaborate, over-the-top, marble interiors. And Belga Queen didn’t disappoint.